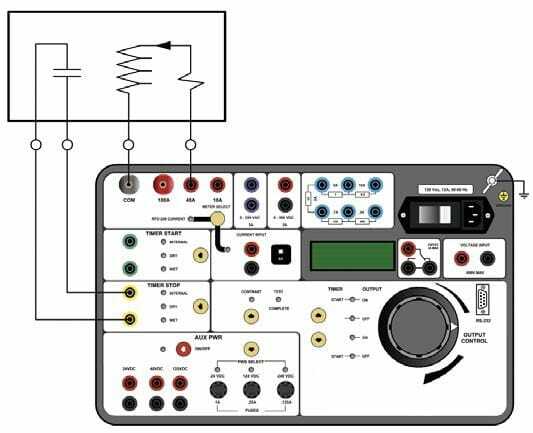 The ARFD-200 is a portable relay test set that delivers performance verification testing of electromechanical, electronic, and microprocessor based protective relays in their operating installations. The ARFD-200 is a rugged test set suitable for testing a variety of protection relays operated in both indoor and outdoor environments. The unit’s ergonomic design and intuitive control panel layout make it ideal for first-time users who have little or no training. The ARFD-200’s digital timer features independent start and stop trigger inputs designed to measure the time between event transitions and to display the elapsed time in both milli-seconds and cycles. The ARFD- 200’s timer has three different trigger inputs; Internal Trigger, Dry-Contact, or Wet-Contact. The Internal Trigger can start or stop the timer by sensing the application or removal of the unit’s voltage or current source. The Dry-Contact can trigger the timer by detecting a change in state of the dry-contact input. Similarly, the Wet-Contact can trigger the timer by detecting a change in state of the voltage input. Thus, the three inputs can trigger the timer by the presence or removal of the unit’s voltage or current source or by changes in voltage or current states. An AC current source with three outputs (10A, 40A, and 100A) provides test current to relays. The current source output can be programmed to synchronize with the ARFD-200’s timer. After a test is completed, the test current reading is latched and displayed on the LCD screen. This feature reduces the possibility of overheating the relay coils. A set of NO/NC dry contacts change state when a test is initiated. 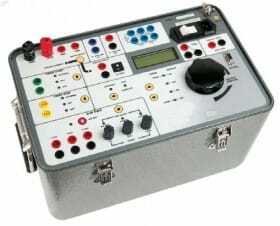 An AC voltage source is available for testing relays up to 250 Vac. The AC voltage source output can be programmed to synchronize with the ARFD 200’s timer. A 0 – 300 Vdc voltage source is also available. The DC voltage source can also be programmed to synchronize with the ARFD-200’s timer. One volt meter input (0 to 600 V input range) is available on the ARFD-200. The test current is displayed on the unit’s backlit LCD screen that is viewable in both bright sunlight and low-light levels. The current measuring range is from 0.00 to 250 A. A second ampere meter is also available and can be used to read an external current input. The external current input is rated at 6 A max and is protected by a circuit-breaker. The ARFD-200 provides three power supplies (24 Vdc, 48 Vdc and 124 Vdc) for powering solidstate or microprocessor-based relays. The ARFD-200 features built-in power resistors for fine current adjustment.